It's Saturday. Let's find a little peace and quiet. These are the gardens that run along by Fort Antoine. Through the palms you can see Cap Martin. 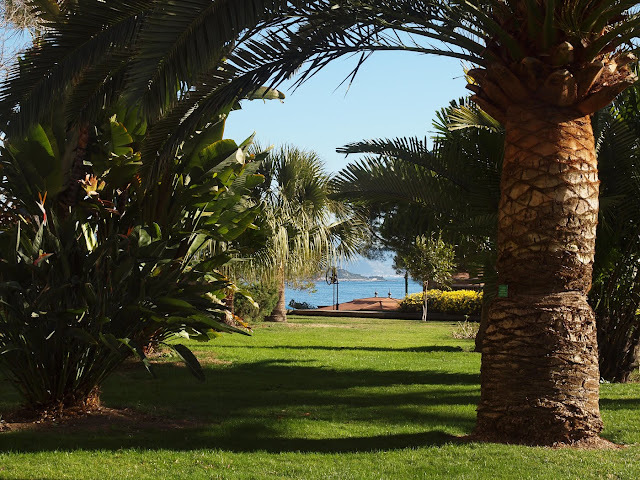 Lovely little vista through the palms ~ you have found your quiet place. Beautiful! It looks like an island resort, Jilly. Very peaceful. Look forward to your visit, Freda. And INeke, many thanks for that. Sometimes I do wonder how I keep it up because it's a lot with both blogs and Riviera Dogs too but so far so good. Just I love this area so much so it's easy!